What is often out of view in those professional race photos are the rider's pedals. 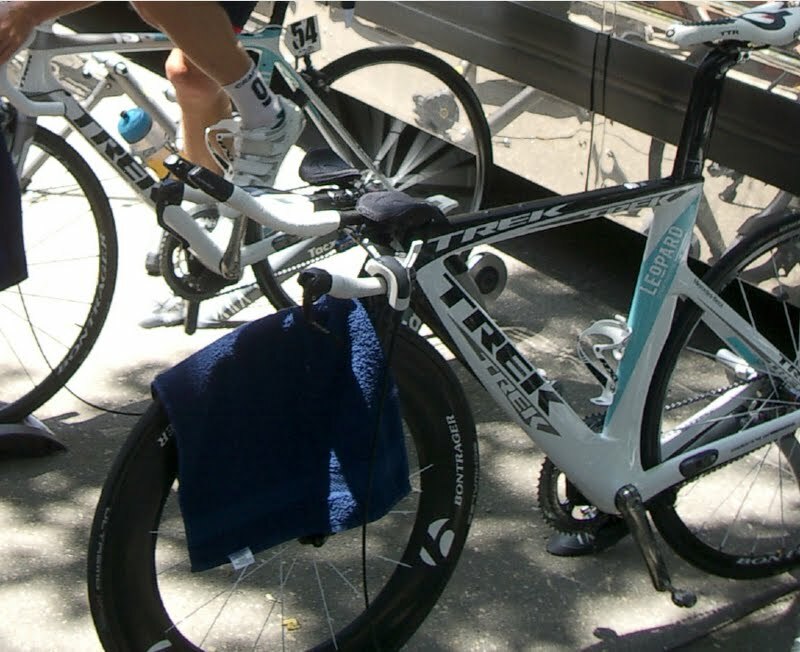 If you are curious about the kind of pedal Zabriskie uses or Cancellara, or what holds Cavendish steady during his sprints, the answer is far more simple than you might imagine - they use the same pedal as their teammates. 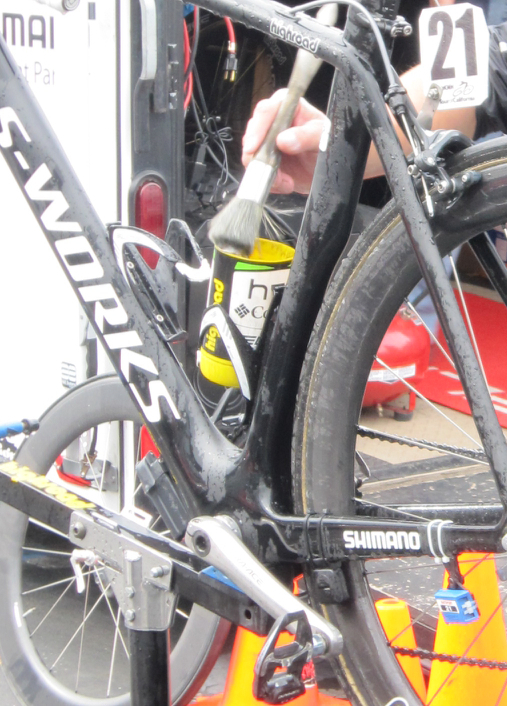 Most teams have a pedal sponsor just as they have a bike sponsor. 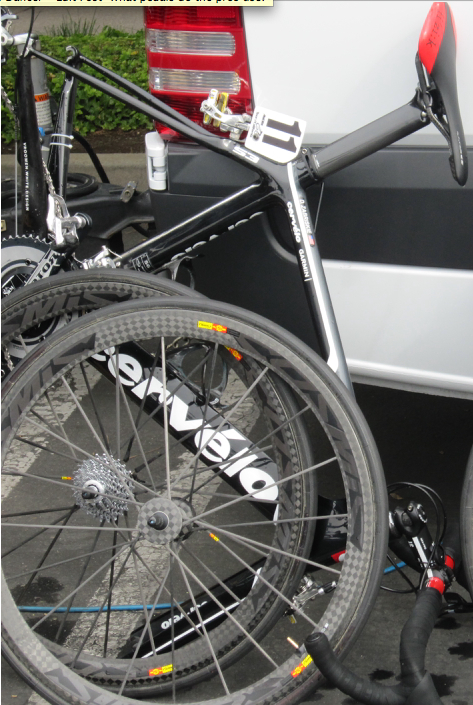 So if you know the team pedal sponsor, you know what is attached to the bike and what is hidden under the shoe of the best riders in the world. 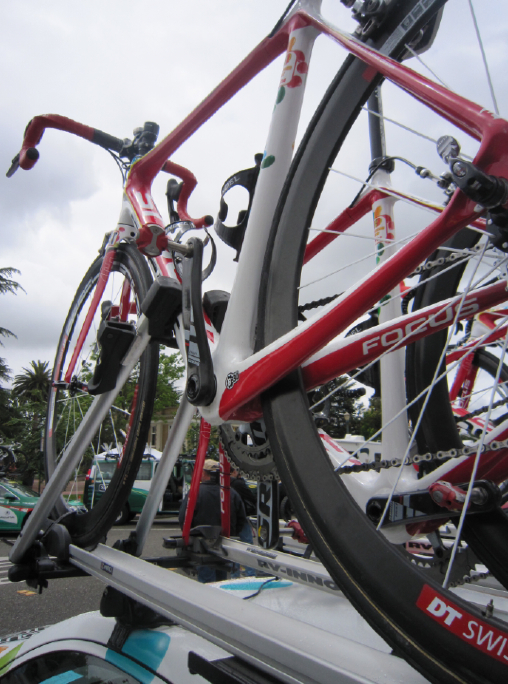 As amateurs we pay a lot of attention to our pedals and cleats, wouldn't it matter to the professional? 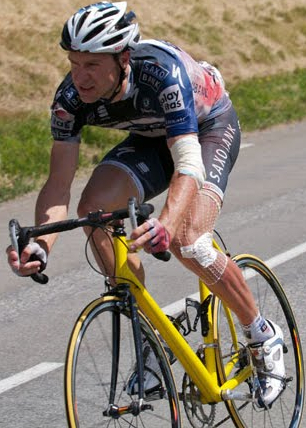 After all we are talking about riders who are hypersensitive to a saddle that is 1mm too high, they must feel the difference between a Look, Dura-Ace, or Speedplay pedal, right? Well maybe they can tell the difference, but unlike us, they don't get to decide which pedal to use. 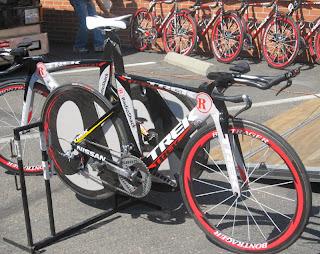 Just as a rider in a team uses the same brand of clothing, helmets, sunglasses, bike frames, wheels, tires, and saddles as their teammates, the pedals they use are the same as well. What differs is the model used by each individual rider. 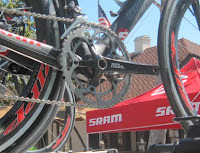 The same pedal brand is used whether they are a sprinter, time trialer, or climber, but the rider is given some limited model choice within the brand. 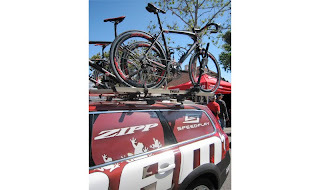 Models may change depending on the type of stage, Speedplay makes a pedal (Zero) better suited for the cobbles in mud, or on super muddy days a mountain bike model might be used. 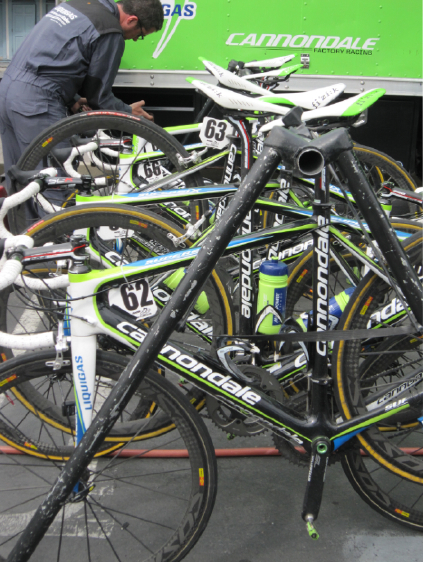 Other than that, the pedals used by a team remain and appear almost identical with a few select variances in color or model and perhaps float of the cleat. The same applies to the other equipment used by a cycling team. Their sunglass frames and colors may be an individual choice, their bike frames differ in size according to their optimal fit, their stems are different lengths, their seat post are set at different heights, and their saddles are different shapes, color, and ages. It took me years to dial in my bike fit, get my cleats just right, my saddle feeling good, the team chamois is finally a good one, sunglasses don't fog up, super happy with my teammates, okay - my helmet still divots my forehead, but heck. 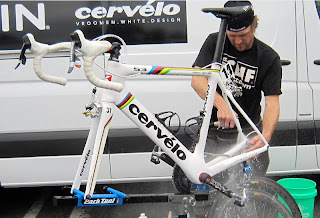 A professional cyclist who changes teams, often changes everything. 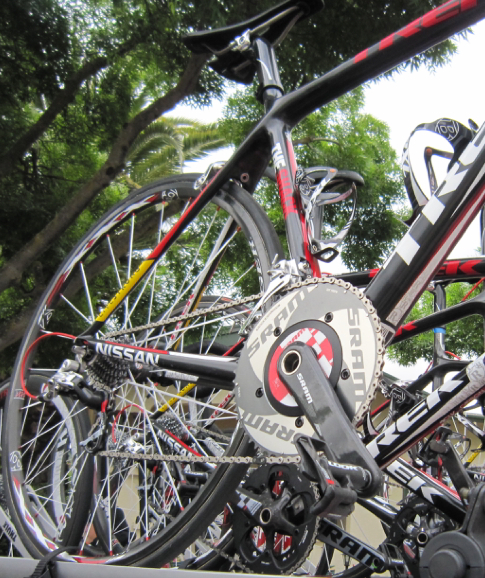 It can be a big deal and can happen every 2-3 years when a rider signs a new professional team contract. Can you imagine changing out all of your gear that often? There have been a few exceptions to the team pedal rule. Lance Armstrong stayed true to his Shimano pedals even when his teams Astana and Radioshack used Look pedals. Taylor Phinney did not appear to be using Speedplay pedals for the time trial at the Tour of California. 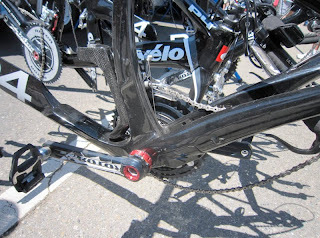 Thor Hushovd stayed on his Speedplay pedals for awhile but has now switched to using the Garmin-Cervelo team sponsored pedal manufacturer Shimano Dura-Ace. I have been looking forward to creating this post for almost a year. 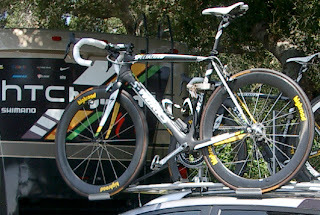 To help you unlock the mystery of which rider is on top of what pedal, here are PedalDancer.com's photos of the team bikes at the 2011 Tour of California - with pedals attached. Look sponsors teams including: Radioshack, Kenda, Quicksptep, Katusha, Lampre, Movistar, Omega Pharma-Lotto, Astana, Movistar, and Vacansoleil. Speedplay sponsors teams including: Leopard Trek, Liquigas-Cannondale, BMC, Saxo-Bank Sunguard, Bissel, United Healthcare, Jelly Belly. 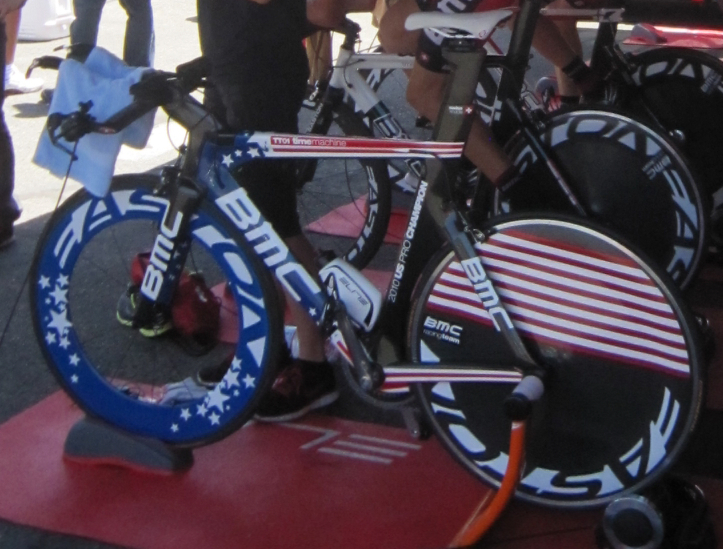 Taylor Phinney's time trial bike - those are NOT Speedplay pedals, so what is up? Is it his recent knee pain? And if you are wondering how the neutral support bikes supplied by SRAM work - they have no pedals. 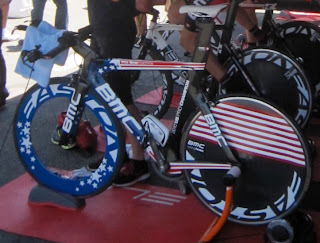 I suppose they must be added out on the road depending on the cleats the rider has on his shoes (that is if a rider ever actually uses one of these bikes). 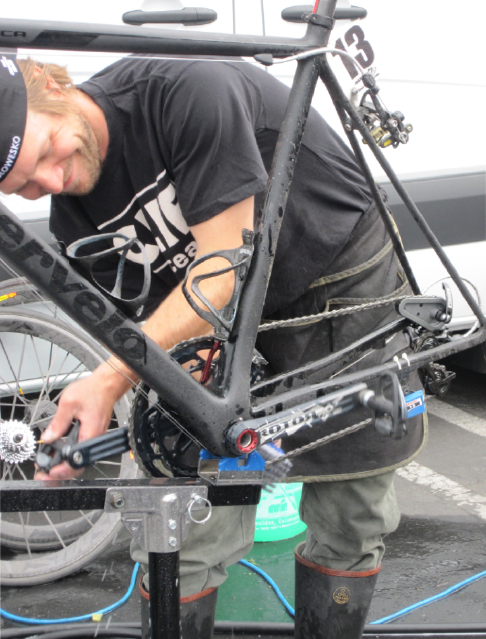 Of course if you are Jens Voigt - any old bike pedal will work, even toe clips. Fabian Cancellara uses Speedplay pedals, as does Andy and Frank Schleck, and Jens Voigt. 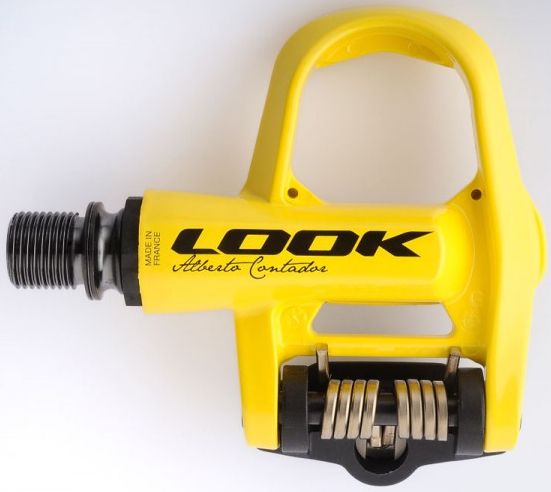 Ivan Basso, Alberto Contador and Cadel Evans also use Speedplay pedals. 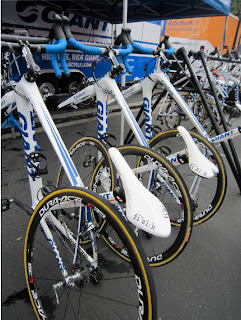 Mark Cavendish, Matt Goss, Bernhard Eisel and the other power horses on HTC Highroad ride Shimano Pedals. 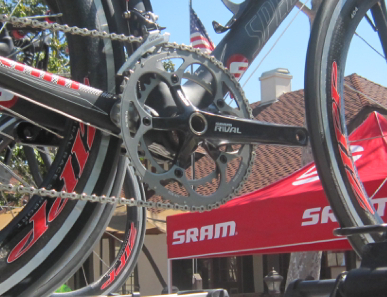 Oscar Freire, Thor Hushovd, Tyler Farrar, David Millar, and David Zabriskie win on Shimano pedals. 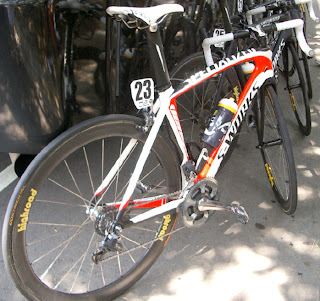 Bradley Wiggins recently won the Criterium Dauphine on Shimano pedals. 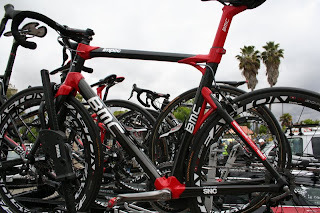 Vinokourov, Jani Brajkovic, Chris Horner, Levi Leipheimer and most of the European teams ride Look pedals, including the sprinter Tom Boonen. It appears to me the equipment that differs most on the bikes of pro riders - is the saddle. Again the riders use mostly the same brand (sometimes they sneak in their favorite), but definitely different models, sizes, colors, ages, and shapes. You might not see this in official sponsor bike photographs, but what is on the bike, supporting the rider, is placed specific to what the rider likes, and can be quite unique (and often travels with the rider, along with the seat post sometimes). Apparently saddles matter. Again it is out of view, so you can't tell unless you see the bikes without the riders, and they are lined up in a row, just before the race begins. Go to a stage start some time and check it out. The topic of saddles alone is worthy of another future post. Related posts by PedalDancer: What tires and wheels do the pros use?